On 8 December 2004, Mia Hamm and Julie Foudy ended their national team careers with a 5–0 victory over Mexico. 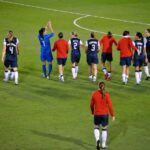 Played before a crowd of 15,549 in Carson, California, the match was the last of a 10-game “Fan Celebration Tour” scheduled in honor of the team’s victory in the 2004 Women’s World Cup. 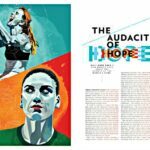 It was the 271st appearance for Foudy, who had captained the team since 1991 (she was a co-captain from 1991 to 2000), and the 275th appearance for Hamm, a number exceeded only by Christie Rampone’s 311 and Kristine Lilly’s 354. Hamm retired as the national team’s all-time leading goalscorer with a total of 158, though Abby Wambach later set the current record at 184. Hamm did not score against Mexico, but she provided assists for the first two goals, scored by Aly Wagner and Wambach. They each completed a brace as the hosts went up 4–0 by the break before winning 5–0. Hamm and Foudy’s retirement, along with that of teammate Joy Fawcett, who was unable to play due to injury, ended a dominant period for U.S. football in which the women’s national team won two World Cups and two Olympic gold medals.